After our wet, arduous walk yesterday, it was lovely to see the sun again. 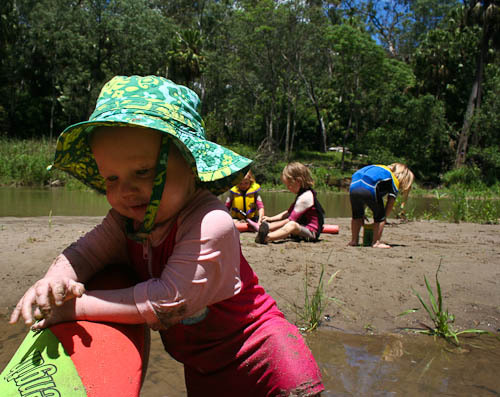 We were happy to use the lovely weather for a bit of casual water play in the Carnarvon National Park’s swimming hole called the Rock Pool. 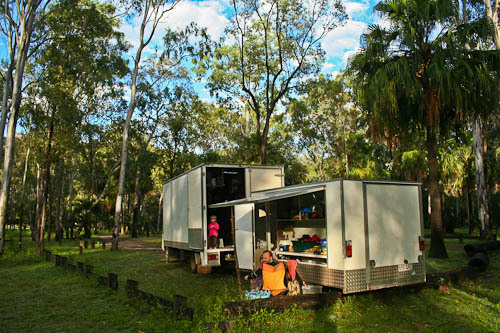 The next day, after a *very* good night's sleep, we woke to beautiful sunny skies at the beautiful Carnarvon Gorge! 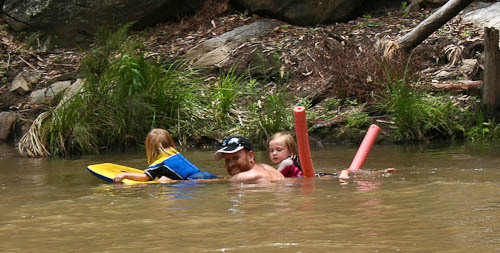 The Rock Pool is located in a bend of the Carnarvon Creek which is a bit deeper than other sections of the rocky river. 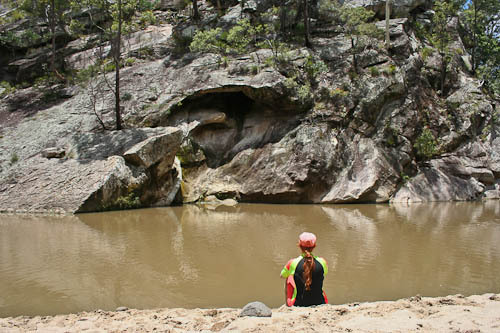 It’s also known as a spot to see platypus and turtles if you arrive at dawn or dusk and sit very quietly, but we’re a noisy group of people and just wanted to play. Delaney was strapped to me all day yesterday, so I was glad to let her have some free play! Brioni has taken to wearing this life jacket all the time! 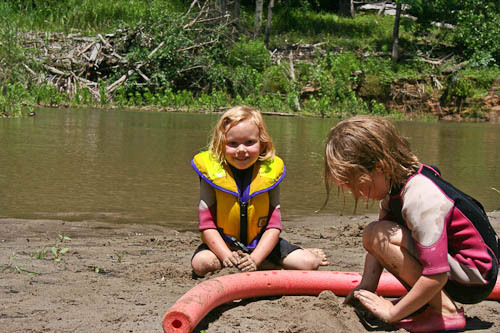 She can swim fine but gains confidence with the life-vest and asks to put it on before she approaches water. Delaney really enjoys water play. 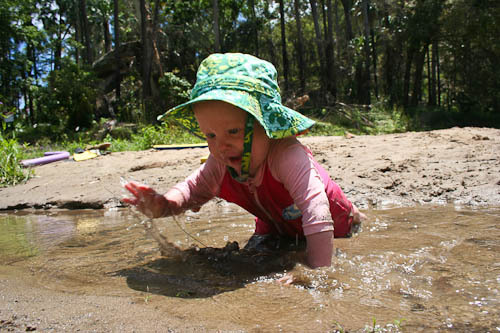 I found a shallow section of the water where she could play freely. 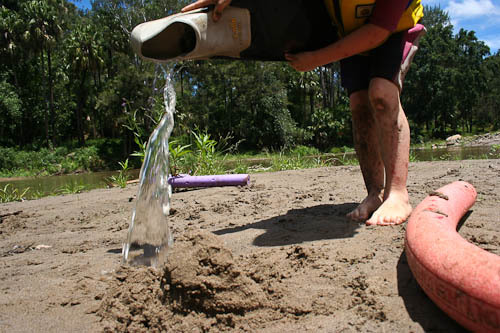 The girls imaginatively used the heel of the flipper as a water carrier for their sand castles. She's such a happy baby! 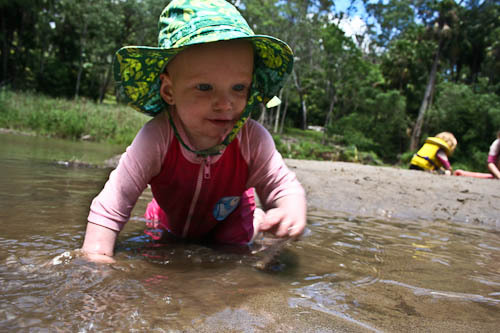 Dell didn't complain at all yesterday, and today she was happy to play in the water! 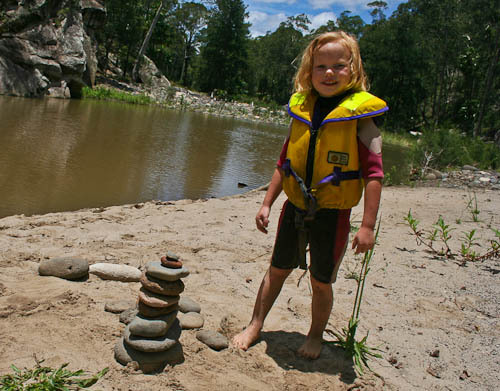 Inspired by the mini rock towers we saw on the banks of Carnarvon Creek over the last couple days, Brioni worked hard to locate flat rocks so she could make her own tower. After collecting specimens, she lined up all her rocks to properly assess which ones were larger and should be at the bottom. I was sitting here, gazing at the water when I saw the platypus. It popped up onto the surface and I thought — wow, that branch looks like a platypus — and then it flapped its tail and disappeared under the surface. David also saw a pretty little turtle, but the girls weren’t around. I’ve seen a few poke their heads out of the water at various locations we’ve swam at, but I haven’t yet been able to show one to the girls on this trip. While Brioni was building her towers, David took Calista and Aisha over to the other side and climbed up some of the great granite boulders. 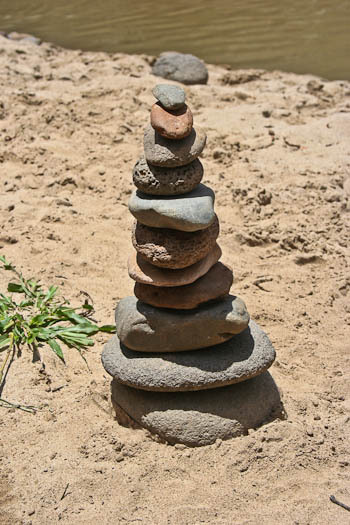 Brioni's rock tower gained several more levels before she was done with it. I'm amazed at how well she built it!